Michigan dunes are a part of the largest freshwater dune system in the world, so large they are visible from space. Built by glaciers thousands of years ago, approximately 275,000 acres of dunes line Michigan's shores today. We cannot protect this incredible resource without first understanding their importance to our environment, economy and quality of life. NEW - video showcasing dunes in southwest Michigan, Van Buren County. The video was paid for by Preserve The Dunes as part of the Syndicate Park Restoration and Education Project. Below are several resources about sand dunes. An event Loving our Dunes to Death? Balancing Enjoyment with Conservation was held in November 2017. 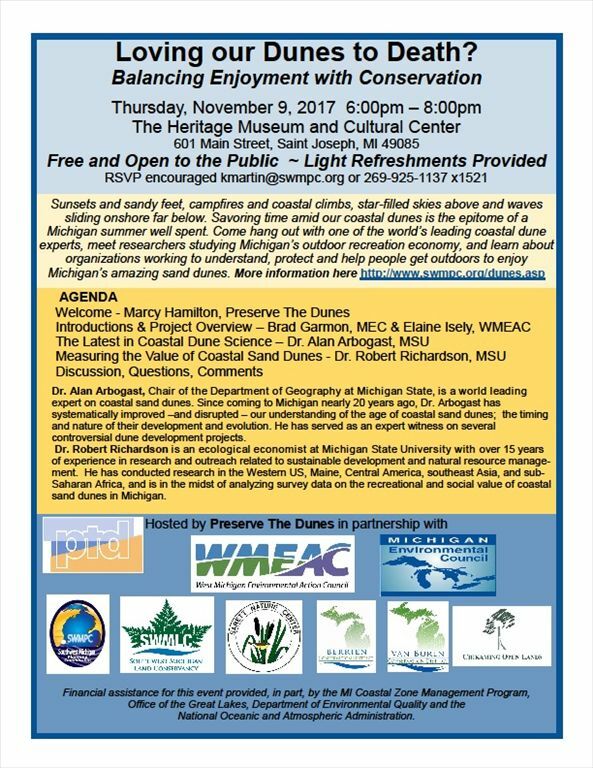 Click here to view the press release covering the event and summarizing preliminary results from a survey about dunes. 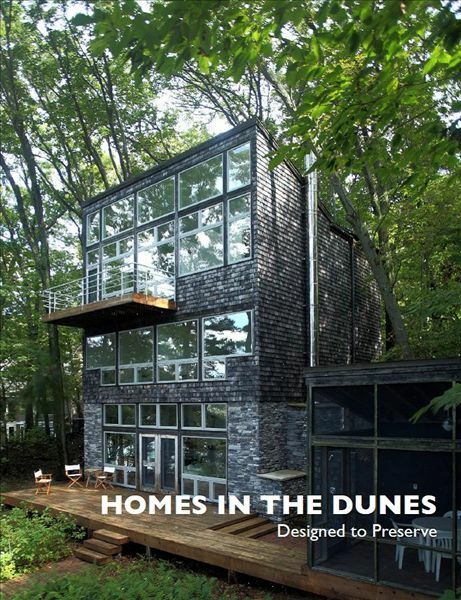 Featured Resource: Click here to view the Booklet: Homes in the Dunes: Designed to Preserve: Learn about ways to build in the dunes in a sensitve and responsible way. Click here to learn about the Syndicate Park Dune Restoration Project in Van Buren County, MI: Van Buren County is in the process of restoring 25 acres of dunes by limiting public access, planting native plants and educating the public. Calvin College Lake Michigan Coastal Dunes: This website explores the physical characteristics and processes of Lake Michigan coastal dunes, using the dunes of P.J. Hoffmaster State Park as examples of landforms and processes. Michigan Natural Features Inventory - Open Dunes: Learn about the dune ecosystem and the plants and animals that live in the dunes. Michigan Department of Natural Resources Coastal Dunes: Dune formation, types, and ecology. Living In The Dunes: A Homeowner's Guide to Landscaping in Indiana's Dune Communities - This guide aims to provide you with the tools to help protect the landscape of the nearshore dune communities. As a resident of the Indiana Dunes community, you have the ability to help protect the dunes at the most local level - your own yard. Heart of the Lakes: Land Conservancies in Michigan can help you protect sand dunes and other significant landscapes for future generations. Contact your local land conservancy today. In Southwest Michigan visit www.swmlc.org. Preserve the Dunes, Inc. is a grass roots, not-for-profit organization. Our purpose is to protect the sand dunes of southwest Michigan from harm and destruction. Michigan Dune Alliance: Dune Alliance partners are engaged in a landscape-scale, terrestrial invasive plant management project funded by the National Fish and Wildlife Foundation’s Sustain Our Great Lakes grants program and significant private and partner support. Active and advisory members include regional land conservancies, state and federal agencies, universities, and other non-profit conservation organizations. This page last updated on 1/15/2018.